For five innings it didn’t appear that the Pirates had any life. They had just two base runners in that span, and one of them was erased via the double play. All in all, through five the Pirates had hit just three balls in the air. Everything else was a grounder or a strikeout. But then came a sixth inning rally that put them ahead for good. Unsurprisingly, we can attribute it to the Pirates’ crop of young talent. Moving the Needle: Neil Walker goes opposite field with a go-ahead double, +.301 WPA. 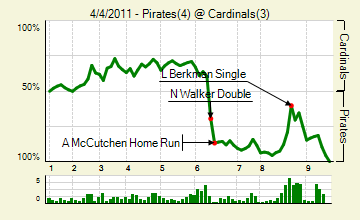 Even into the sixth, the Pirates had trouble hitting the ball in the air. The inning started with a Ronny Cedeno single, but it was on a grounder. Pitcher Charlie Morton, who had already walked four to that point, stayed into sacrifice. Such is the plight of the road team in the NL. Jose Tabata followed by drawing the first walk of the game. 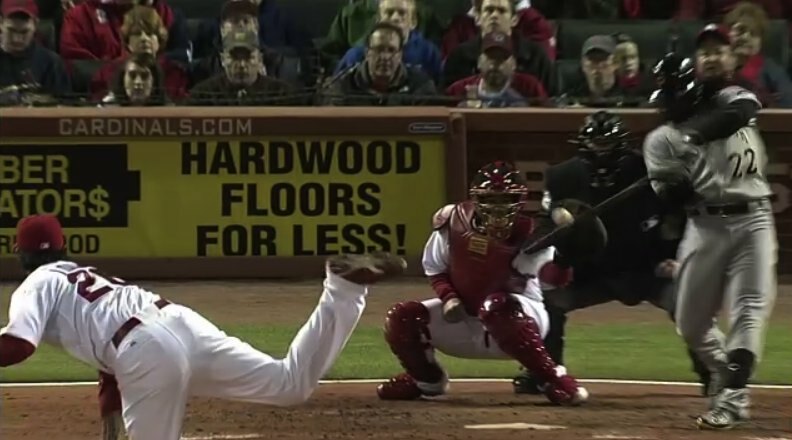 Then Lohse made his biggest mistake, leaving one up and out over the plate to Walker. He drilled it into the left field corner, scoring both Morton and Tabata and giving the Pirates the lead. They’d need the tack-on runs that followed, as the Cardinals mounted a comeback. But it wasn’t enough. Andrew McCutchen: 1 for 4, 1 HR. His two-run blast, which immediately followed Walker’s double, provided the insurance that the Pirates needed. Two of his three hits this season have been long flies. Kyle Lohse: 7 IP, 6 H, 4 R, 4 ER, 1 BB, 5 K, 1 HR. Outside of the sixth he faced just one over the minimum, thanks to two double play balls. But that sixth inning was enough to hang the L on him. Joel Hanrahan: 1.1 perfect innings, 2 K. The Pirates — really, Evan Meek — ran into some problems in the eighth, with the Cardinals mounting a rally. Hanrahan came into the game with two outs and a runner on third and struck out Yadier Molina to end the threat. He then got three easy outs in the ninth to end it. He’s off to a fine start, with 3.1 IP, 2 H, 0 R, 1 BB, 5 K.
Moving the Needle: Dan Uggla homers to put the Braves ahead for good, +.280 WPA. The Brewers had plenty of chances in this one. They had eight at-bats with runners in scoring position and failed each time. The lone run came on a Weeks homer to lead off the third. 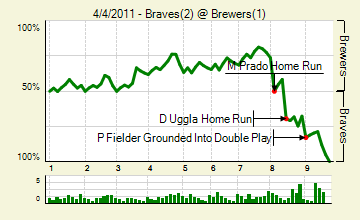 The Braves, on the other hand, had zero at-bats with runners in scoring position. They put eight runners on via singles and walks, but never advanced them past first. It was a good thing, then, that Martin Prado led off the eighth with a game-tying homer off Takashi Saito, and that Uggla’s long drive hit the top of the wall. 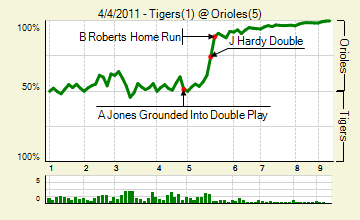 It might go down as Just Enough on Hit Tracker, but it was also just enough to win the game. Chris Narveson: 6 IP, 3 H, 0 R, 0 ER, 3 BB, 5 K. Add in seven ground balls and you have quite a start from the 29-year-old. Rickie Weeks: 2 for 4, 1 HR. Half of his six hits this season have been home runs, and all his home runs have led off innings. Brandon Beachy: 6 IP, 4 H, 1 R, 1 ER, 1 BB, 7 K, 1 HR. I have nothing to add that Dave Cameron didn’t already cover. 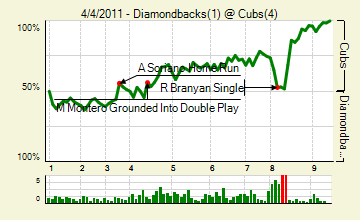 Moving the Needle: Diamondbacks fail with the bases loaded, -.346 WPA. Strangely, the highest positive WPA swing in this was a mere single, not even of the run-scoring variety. In fact, it led to the negative swing. The top of the eighth was a Kerry Wood inning. It started when Justin Upton reached on an error, and then continued when Russell Branyan hit the aforementioned needle-moving single. A ground out to the pitcher put runners on second and third, but an intentional walk loaded the bases. These types of runners-on situations is, as I’ve learned, where Wood shines. He took off the sac fly threat by striking out Ryan Roberts, which was -.170 WPA. Then he got Gerardo Parra to hit a lazy fly to left, which accounted for the remaining -.176 WPA. 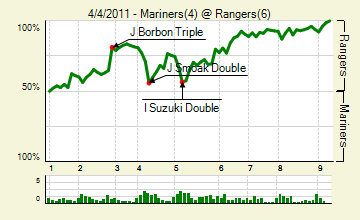 So there were the biggest positive and negative swings of the game, by the same team, in the same inning. It preserved the Cubs 2-1 lead, onto which they tacked a few more runs in the next inning. Randy Wells: 6 IP, 6 H, 1 R, 1 ER, 4 BB, 6 K, 1 HR. When Willie Bloomquist hits a leadoff homer against you, it’s the sign of a long day to come. But Wells recovered nicely. He got some help from double plays, and from his catcher throwing out Justin Upton trying to steal second. Geovany Soto: 2 for 3, 2 2B, 1 BB. His second double added some insurance in the ninth, right after the Diamondbacks threatened in the eighth. And then there’s the aforementioned caught stealing. Moving the Needle: Brian Roberts breaks the tie with a three-run homer, +.142 WPA. That’s twice in the young season that Roberts has not only moved the Orioles’ needle, but moved it with a tie-breaking three-run homer. Tigers starter Rick Porcello was looking good through four, but he apparently ran out of gas in the fifth. It started with a single and then a double, which Roberts immediately followed with his game-breaking shot. Nick Markakis followed with a double of his own, and then Wieters drove him home to give the Orioles their five runs. Matt Wieters: 2 for 3, 1 2B, 1 BB. He needs a big year, and he’s off to a good start. With yesterday’s performance he’s now 5 for 13 on the season. Jason Berken: 2 IP, 1 H, 0 R, 0 BB, 3 K. He’s taken nicely to the bullpen, and has announced his presence with authority in 2011 (6 K in 3 IP). Moving the Needle: Alex Rodriguez hits a laser, +.167 WPA. Might it have been retribution? 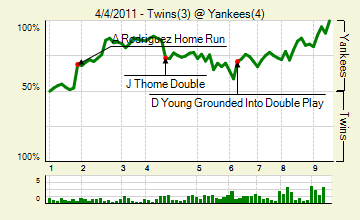 Just before Rodriguez came to bat, Twins starter Scott Baker plunked Mark Teixeira in the toe with a pitch. A-Rod picked up his teammate by turning on an inside fastball and hitting a line drive into the left field stands. The Yankees would need more — namely, Jorge Posada’s third two-run homer in two days — but they’d get a big boost in the first from thier cleanup hitter. Tsuyoshi Nishioka: 2 for 4, 1 2B. His RBI double in the fifth brought the Twins to within one. It was his first extra base hit as a big leaguer, and easily the best of his four games. Joba Chamberlain, Rafael Soriano, Mariano Rivera: 3 IP, 2 H, 0 R, 0 BB, 2 K. In two of the first four games these three have completely shut down the opposition. Nelson Cruz: 2 for 3, 1 HR, 1 BB. Four days, four homers for Cruz. We hoped you liked reading The Morning After: Games of 4/4/2011 by Joe Pawlikowski! Twins’ Baker: 4BB and a hit batsman in 6 innings. Ew.